Trampolines are one of the best ways to have a fun-filled afternoon in the sun, bouncing up and down for hours. Mini Exercise Trampolines are great way to work out your entire body in a way that’s a lot of fun. Unfortunately, not everyone has the room for one, or a large trampoline isn’t in the budget or able to fit in the space of your backyard. Regular exercise on a trampoline can be a safe, great way to get in some cardio time if running or working out using gym equipment isn’t exactly your thing. Interestingly enough, trampolining can also help your mental health, as well. It leads to improved biological imbalances within your body, especially where the flow of your lymphatic system is concerned. The low impact on your body when using mini exercise trampolines is also a lot easier on your ankles and feet compared to running as a workout. As a result, you use more energy trampolining but feel less tired and are actually putting a lot less stress on your body. If you’re looking for the best mini exercise trampolines for adults, we have a lineup of our top 5 picks. Each mini trampoline brings something different and unique to the table, so feel free to discover them for yourself! The 38” InTone Plus by Stamina is one of the best mini exercise trampolines that will only cost you around $40, making it a very budget-friendly option to choose. It has a large, heavy-duty, durable polypropylene jumping surface with a 38” wide steel frame. It has a maximum weight limit of 250 pounds, weighs as little as 13 pounds, and has the option to purchase a 2-year protection plan when you purchase it. 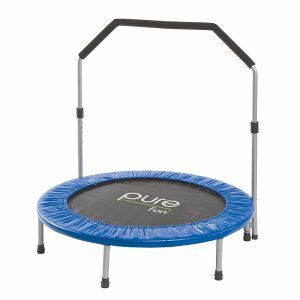 It has an optic blue border that ensures you stay within the middle of the mini trampoline for a safe, fun workout. The 38” InTone Plus by Stamina is a great choice for both beginners and experts alike. 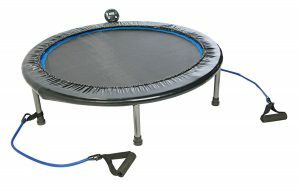 It offers a couple of extras on top of the mini trampoline itself that make the $40 price tag more than well worth it. The Mini Exercise Trampoline by Activox will cost you around $170, comes with an adjustable handlebar that will help you to control your balance, and has a maximum weight limit of up to 175 pounds. The handlebar is the size of most adults, but it can also be adjusted in case your children are interested in giving it a go! You can opt for either a 2 or a 3-year protection plan when you make your purchase, too. The Mini Exercise Trampoline by Activox is truly an exceptional mini exercise trampoline for adults and children alike. The adjustable handlebar ensures that it can be used for both serious workouts and fun. The Mini Foldable Exercise Trampoline by Upper Bounce will cost you around $82, has a 48” bounce surface, and can also be bought with a 40” bounce surface. However, we’ll be focusing on the 48” bounce surface for this review, which has a maximum weight limit of 200 pounds. It comes with an adjustable, padded foam handrail for added stability with springs that connect set-wise to the base for added bounce. Heavy-duty welding has been done on the legs and the handrail to ensure that everything is locked in the way it should be. The safety pad also keeps your feet away from the edges and from getting hurt. The Mini Foldable Exercise Trampoline by Upper Bounce is a great option for those looking to have a number of handrail positions for multiple workout ideas. It’s also a great option for kids, too! 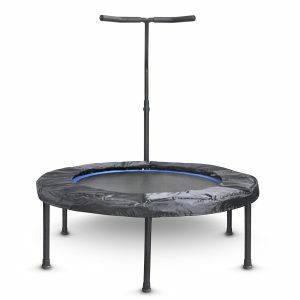 The 40” Mini Trampoline by Pure Fun costs approximately $70, has an adjustable handrail and certification from the CE, the TUV/GS, and the ASTM. It has a maximum weight limit of up to 250 pounds and a handrail that’s adjustable from 39” all the way to 42”. The jump surface is made of heavy-duty polypropylene for extra durability as well as 36 sturdy 2.75” galvanized steel for the best bounce possible every time. There’s also a 90-day warranty available in case you don’t like it. 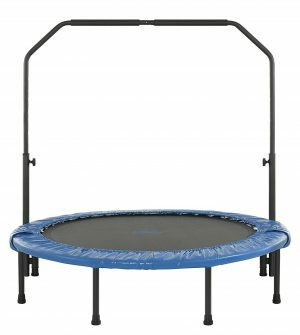 The 40” Mini Trampoline by Pure Fun is a great option for anyone who wants something cheap and completely within their budget. It’s great for a cardio workout like no other. The Trampoline With Safety Pad by ANCHEER will cost you between $64 to $81 because it comes in 2 different sizes – 38” and 40”. You can also choose to go with a model that folds or one that does not, whichever your personal preference may be. The maximum amount of weight either one can handle is 220 pounds, it comes in 4 different color choices, with a jumping surface made of the typical PP material. Because the springs are resistant to rust, you can have it both indoors and outside, as well. 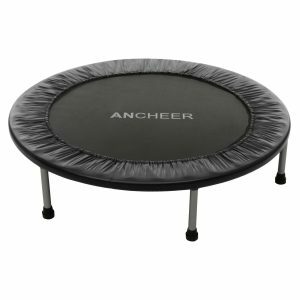 The Trampoline With Safety Pad by ANCHEER is an awesome option for those who are looking for something dynamic. We highly recommend the double fold model! Our top pick has to be the 38” InTone Plus by Stamina. It’s simple, effective, and gets you started on your healthy journey at a cost that simply cannot be turned down. It’s the best model to start with, in our honest opinion. The health benefits of using a mini exercise trampoline in your home for exercise purposes are second to none. They offer a full body cardio workout that allows you to take control of your life and be as active as you want to be, whether it’s inside your home or in your backyard.